Hotel Lalitha Mahal Palace Mysore, Lalitha Mahal Palace Hotel Mysore, Reservation for Hotel Lalitha Mahal Palace, Mysore, India. Address: Siddhartha Nagar (P.O), Mysore - 570 011, Karnataka, India. Accessibility: 160 kms. from Bangalore Airport, 8 kms. from Railway Station, 4 kms. from Bus Stand. 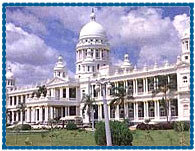 Hotel Lalitha Mahal is situated at the Chammundi hill, overlooking the beautiful Mysore City. 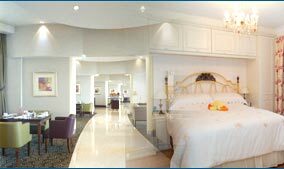 It is one of India's most opulent hotels run by the Ashok Group of hotels. Hotel offers a majestic two-storied building with twin ionic columns with a projecting porch on the ground floor. 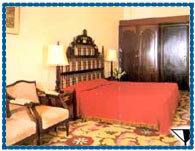 It offers an experience of princely living in a real Maharaja's palace. 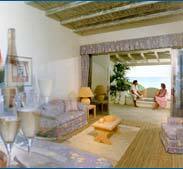 Hotel offers 54 rooms comprising turret rooms, viceroy suites, duplex suites and double suites. All the rooms and suites are decorated in a royal style with modern amenities like centrally air conditioned, attached baths, running hot and cold water, telephone, multi channel TV and private terrace sit out. 24 Hrs. Room Service, H/C running water, Telephone, T.V. 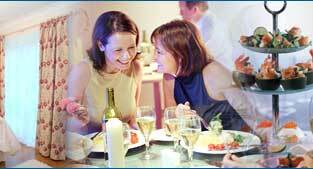 Other facilities, Executive Lounge, Banquet & Conference Facilities, Beauty Parlour, Private Parking, Shopping Arcade, Health Club, Swimming Pool, Billiards, Indoor Games, Jogging Track, Golf, Tennis, Doctor on Call, Laundry, Money Changer, Banking, Safe Deposit, Baby Sitting, Valet, Travel Desk Service, Postal Service, Heli Pad.